A wood floor is an investment. We protect that investment by offering you the very best in durable finishes. Unlike grandma's waxed floors, today's wood floor finishes provide an easy care surface perfect for the busy homeowner. These finishes are usually polyurethanes and remain on the surface of the wood and form a protective coating. Surface finishes are popular today because they are durable, water-resistant and require minimal maintenance. Various gloss levels are available. In addition to durability and easy care, a chief concern is safety, the safety of your family and the safety of our planet. For this reason, in addition to our dustless sanding equipment, we promote the use of products that have no or minimal impact on the environment. You have probably heard of VOC's, or Volatile (a substance that evaporates quickly) Organic (in chemistry, any substance containing carbon) Compounds. (a compound is a substance formed when two or more chemical elements, such as oxygen and hydrogen, which form water, are bonded together.) Emitted as gases from certain solids or liquids, VOCs include a variety of chemicals, some of which may have short- and long-term adverse health effects. VOCs are emitted by a wide array of products numbering in the thousands. All of these products can release organic compounds while you are using them, and, to some degree, when they are stored. We encourage everyone to consider the use of water based or oil penetrating finishes which contain low or even no VOC's. Eucalyptus wood floor with water-based finish A water base urethane is clear and looks very natural on wood. Some types are more durable than oil-based. It generally takes 3-4 hours per coat to dry. This finish has little odor when applied. We use only two component water based finishes because they are both thicker and far stronger than a standard single component water based finish like you can buy at a big box home improvement store. These finishes are significantly more durable than traditional oil based polyurethane finishes. Bona Traffic brand wood floor finish is the latest generation of these two component water based polyurethanes. Formulated specifically for heavy traffic commercial and residential hardwood floors, Traffic provides unsurpassed durability in a wood floor finish. Whether your floor is newly installed, or a prefinished floor that is in need of recoating, Bona Traffic is the top choice of professionals. A recent addition to their line is Bona Traffic HD formulated for hardwood floor owners with an uncompromising attitude towards beauty, durability and being green. HD significantly outperforms all urethane finishes, including Bona Traffic, after it has been applied for 24 hours. Wax is often used to create a soft, aged luster. Though you may renew the finish yourself, wax water spots easily, requires maintenance and is slippery. Wax is amber in color and has a low sheen. It has a mild odor when applied. Walnut wood flooring with wax finish Tung oil is a penetrating finish which gives a soft hand rubbed look when applied in multiple coats, slightly ambering the wood. It requires drying overnight between coats and has a mild odor when applied. This coating has an appearance similar to, but more natural looking than oil-based poly. Its big benefit is that scratches can be easily repaired without sanding and the touch-up leaves no lap marks. It is a perfect finish for a historic home, mimicking the looks of wax, shellac and varnish. We like European penetrating oil finishes such as WOCA and Rubio Monocoat. These are highly durable VOC-free wood care products for basic treatment and maintenance of wood surfaces. VOC stands for Volatile Organic Compounds and are the strong smelling solvents in oil based stains, gasoline, etc. that can be harmful to your health. The raw materials for these European penetrating oil products are selected with great care, and all are based on vegetable oil components. European penetrating oil finishes are environmentally friendly products and ideal for any green building project. Oil finishes penetrate the wood, leaving no visible surface coating. This results in a low sheen, almost matte finish, giving a very natural appearance. An oil-based polyurethane finish imparts a slight honey colored tint to the wood. This finish ambers over time, which may not be desired on light woods. When applied, it usually takes 8-10 hours per coat to dry and has a strong odor. These finishes are applied at the factory and are exceptionally hard and durable. When finish is applied to prefinished flooring during the manufacturing process, it is done in the most controlled setting possible -- as opposed to the conditions on a job site. The contractor can never fully create the ideal curing conditions found in a mill, so there is a large difference in hardness. All of the finishes listed above are available in pre-finished products. Some companies offer a urethane/ceramic finish which is UV-cured to increase hardness. Other products offer finishes with aluminum oxide particles added to increase the abrasion resistance of the wear layer. This has become extremely popular on the better grades of hardwood floors. 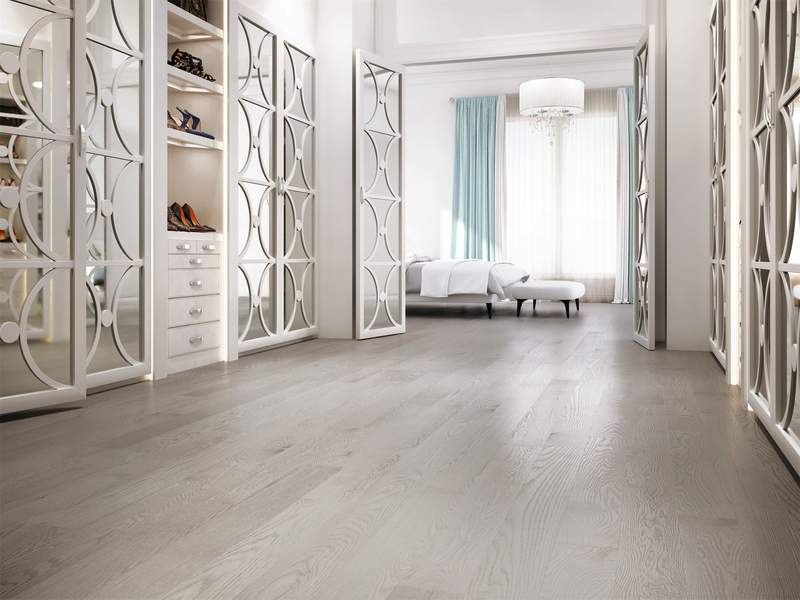 Four different sheens are available for wood floors: gloss, satin and matte. Each one has a different degree of shine, another factor which will determine the look of your floor. Gloss finish is the shiniest and reflects the most light. It will show wear more quickly than all the other all sheen choices because dirt, especially the sandy soil we all have in Tampa Bay, will abrade the finish, dulling it. Animals' toenails, even cats' tiny claws, will scratch the floor and cause it to lose its luster. Semi-gloss is still very shiny without the high glare of gloss. It is the right choice if you should want a fairly shiny floor, but is not recommended with children or pets. Satin is less shiny, while still offering some shine. It is the choice if you should desire a floor that reflects light, but have children or pets. Matte, or flat, has the least shine, and will show light abrasion the least. No floor finish is as flat as is a flat paint, however, this finish offers the least sheen possible in a protective surface finish.